The death of a 63-year-old pedestrian in the circle at 16th and Colesville on Wednesday is a reminder of how dangerous the streets of Downtown Silver Spring are for pedestrians. Sligo at Silver Spring, Singular says that drivers are the true victims, forced to react when a jaywalker darts in front of their car, but I doubt Mike and Wendy Linde, Downtown's crosswalk crusaders, would feel sympathy for someone carrying two tons of steel with them. Downtown streets like Georgia, Colesville and 16th are wide, befitting their status as state highways. But while they carry traffic from as far as Florida, they have a responsibility in the business district to prioritize local traffic. 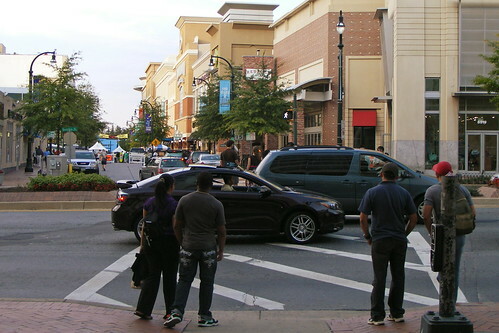 And more and more local traffic in Downtown Silver Spring means pedestrians. Barely half the people who live in below-the-Beltway Silver Spring drive to work alone. The rest either carpool, use transit, or walk and bike, and those are the people you'll see on our sidewalks. Despite all of this, accommodations for pedestrians are rare or nonexistent. Sidewalks on many blocks, like on Colesville between Georgia and Ramsey - a major path for people going to and from the Metro - are barely wide enough for two people to pass each other. Most major intersections don't have fully striped crosswalks. At the circle where the man was killed, there are no crosswalks for 16th Street and Colesville Road. That's three lanes of traffic - even more if you count the wide turning radii at the corners - for someone to cross on foot. Fences like this one along Wayne Avenue may prevent jaywalking, but they don't discourage speeding, making it even more unsafe for pedestrians. 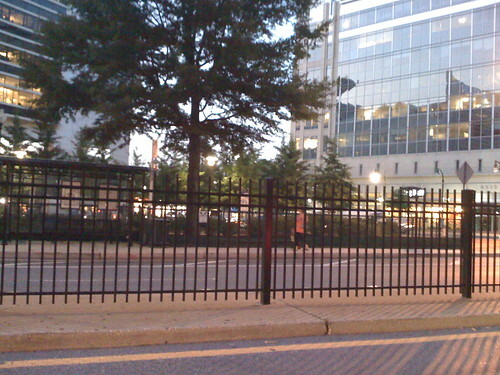 Sligo suggests fences along Colesville Road, but that's a false solution. Fences are useful if you want to annoy pedestrians, but they'll still look for the closest distance between two points and cross there. Just look at how many people walk along the fences installed on New Hampshire and University in Langley Park. 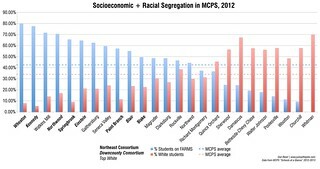 Similarly, you'll never see a lot of people using the skybridges over Veirs Mill Road in Wheaton or East-West Highway in Hyattsville. It's too much of a hassle to go up and down several flights of stairs just to cross a street. The real issue is that the blocks in Downtown are very long and that jaywalking doesn't feel any less safer than crossing at the corner where there may not be a crosswalk. The answer is to create more mid-block crossings that save walkers the hassle of going all the way to the corner while also making it clear to drivers where people will cross. The crossing at Georgia and Ellsworth (above) is an excellent example. The median is raised and nicely landscaped along Georgia, providing a visual barrier to jaywalking. Then, there's a huge crosswalk with a stoplight. Even when the light is green, drivers know to anticipate a pedestrian there. Downtown businesses are increasingly reliant on foot traffic. Just look at Ellsworth. People don't spend exorbitant amounts of money to live in or near Downtown Silver Spring because it's easy to drive, and they don't shop there because it's easy to park. Even those who do drive downtown spend most of their time there on foot, and if it's not attractive for them to walk, they won't. The biggest reason why businesses away from the revitalized area could have trouble getting customers is because people feel like they're taking their life in their hands crossing Georgia or Colesville. The problem is that drivers need to slow down in Downtown Silver Spring, and no fence or posted speed limit will make that happen. You have to put more pedestrians on the street and make a visual statement that higher speeds are not safe. To do that, you have to give walkers confidence to cross the street. Just because the alternative is to walk half a block to a crosswalk, doesn't make it ok to knowingly walk directly in front of an oncoming car. Sure, there could be more crosswalks, but until that changes, one has to work within the existing framework or risk endangering yourself and others. "Crosswalk" means that part of a roadway that is: (1) Within the prolongation or connection of the lateral lines of sidewalks at any place where 2 or more roadways of any type meet or join, measured from the curbs or, in the absence of curbs, from the edges of the roadway; or (2) Distinctly indicated for pedestrian crossing by lines or other markings. What this means that even if there is no paint on a roadway, a crosswalk legally exists wherever a sidewalk crosses a roadway at an intersection. Sixteenth Street has a sidewalk on the east side on both the north and south sides of Colesville Road, which means it has a crosswalk which is not painted, but which is there nonetheless. I doubt this is any comfort to pedestrians trying to cross. I also seriously doubt that many drivers understand that they are required to yield to pedestrians both in marked and in unmarked crosswalks. My only hope is that the police understand this part of the code. Crosswalk - that part of a roadway at an intersection included within the connections of the lateral lines of the sidewalks on opposite sides of the highway measured from the curbs, or in the absence of curbs, from the edges of the transversable roadway; or any portion of a roadway at an intersection or elsewhere distinctly indicated for pedestrian crossing by lines or other markings on the surface. I'm on Dan's side here - mostly because his premise is that we should set things up better for pedestrians - from driving behavior to width of sidewalks to how we lay out our cities - than we do. Even if it were jaywalking, I still buy Dan's premise. The problem here seems to be that disaster of a bastardized traffic circle. It's a entire bloody mystery what the rules are to get through it. 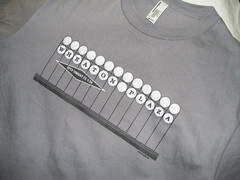 For instance: turning from s-bound 16th onto Colesville going NE - do you follow the light at Western? Turning left from Colesville onto 16th S-bound - do you have the right-of-way like you would in a real roundabout? Has Dr. Gridlock or Bumper to Bumper in the Gazette ever written this one up? PS Dan I'm so with you and the crosswalk crusaders couple - should we stage a sit-in at in the streets at George & Colesville this Monday rush hour? I think it is an exaggeration to say "Despite all of this, accommodations for pedestrians are rare or nonexistent" in downtown Silver Spring. In the name of pedestrian safety they have made almost all corners "No Right Turn on Red." In many cases there aren't enough pedestrians to justify the restriction and in others, where most pedestrians are going the same way most drivers are going, No Right Turn on Red actually results in less pedestrian safety by putting pedestrians in the path of right turning cars when the light changes. The right turn restriction on northbound Second Avenue to eastbound Spring Street is particularly ridiculous. I don't think I've ever seen a pedestrian helped by the restriction, while lots of right turning drivers sit there wasting gas waiting for the light to change. Matt is right - this is a legal crosswalk, even though it does not have pavement markings. The short sidewalk in the median is part of the pedestrian crossing route from the sidewalk on the north side of North Portal to the sidewalk in the circle to the median north of the circle to the sidewalk on the north side of Colesville. Check out an areal view on Google Maps. The crime is that the state and county have done such a poor job of marking this crossing. They lay out curb cuts and sidewalks in the circle and median to encourage pedestrians to cross here, then give motorists very little to alert them of the presence of a pedestrian crossing. There is a staircase down a hill on once side, a sidewalk in the median, and then a sidewalk entry on the other side. While clearly designed to be welcoming for pedestrians, there isn't a painted crosswalk. Needless to say, I rarely see cars looking for pedestrians at this location. There are traffic lights at this circle and one just has to obey the lights and cross at the appropriate place and time. I have crossed this intersection in the past and never had a problem. People who get hit by cars are usually people who do not follow common sense. Drivers do not deliberately try to run over pedestrians. There are SOME traffic lights at this circle, but westbound traffic on Colesville only sees Yield signs upon entering the circle. There is no time when traffic in the circle is stopped completely by lights to permit pedestrians to cross in the unmarked crosswalk that goes to the north and west side of the circle. There is NO "appropriate" time to safely cross at the unmarked crosswalk designated by the sidewalks and curb cuts that are closest to the north side of this circle. That path, clearly indicated as a lawful and recommended path by the sidewalk curb cuts, is a dangerous trap.